We take Pierateering very seriously. We don’t just make these reviews up as we go along. They are carefully researched, written, verified, cross-referenced to other pies and then a few puns are taken from the Big Book of Pie Puns for good measure. One thing is for sure, it is not a game! Although O’Neills pub chain seem to not being taking things seriously enough with their Game, Port & Blackberry pie. What an unacceptable and peculiar flavour! I had to order one just so I could be outraged at how lackadaisical their pie making attempts could be. My initial impressions were confirmed when I was served what can only be described as a squashed pie. By that I mean the pie had been squashed and did not resemble the true pie form as truly as it might have done at the beginning of its life if it was not for the aforementioned squashing. I delighted in taking some score off for the Condition of this pie. 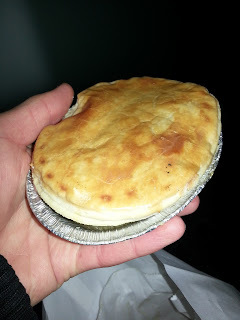 My suspicions that O’Neill’s weren’t taking things seriously were further confirmed by the fact that this pie was square. I have nothing against this in principle but in practice I am judgmental and hold it against them for trying to not be ‘square’ by ironically making their pies square. The pie was also a bit beyond golden brown so was a bit burnt for my liking. What most annoyed me about this pie however was that it was really quite good. 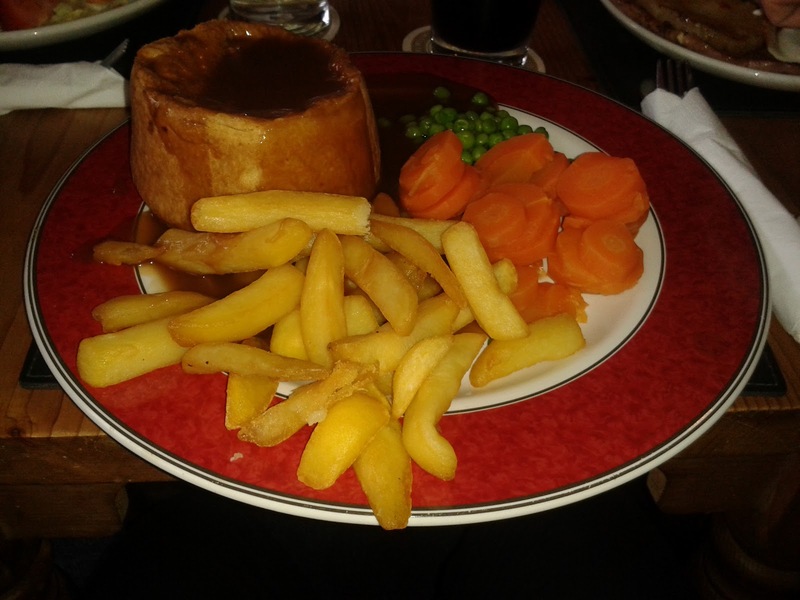 At £8.99 for a pub pie meal it was decent value. Despite having lost marks for its condition the full on flavour more than made up for this. It had a delicious meatiness and the game was lovely and tender. The pastry was nice and gooey and soft. It was all false advertising really as I couldn’t taste the port or blackberry particularly, but I’m not sure I really wanted to. What you really need to know is would I be game for another one? Fortunately for O’Neills they have won this particular mind game with me. Their game pie is set to match their competitors. continue reading "Pie Rating, It’s Not A Game!" Are you wondering what the best pie in London is? Well then, you've come to the right place - Pierate, the Pie Review Blog! We've had a fairly solid set-up in London for a while now, so we've reviewed quite a few London pies. And while we admit there's rather a lot of the little beige delights still tucked away in various shops, stalls and pubs around London that we haven't got our hands on yet, we've rated loads of top London pies and our mission is to try and pie rate them all! Our highest ranked pie thus far was purchased in London. It was a Paul's Pie, bought from a farmers market in Notting Hill. 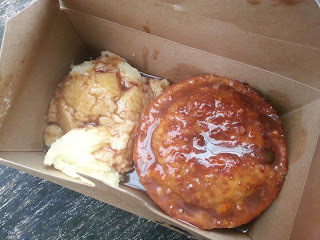 Then who can forget Piebury Corner, with their three very highly scoring pies available on the Holloway Road. There's a good few Pieminister pies scoring highly on the pie rankings too - and although those specific pies weren't actually purchased from the Leather Lane Farringdon store, we have bought pies from there too and can confirm they are rather good. 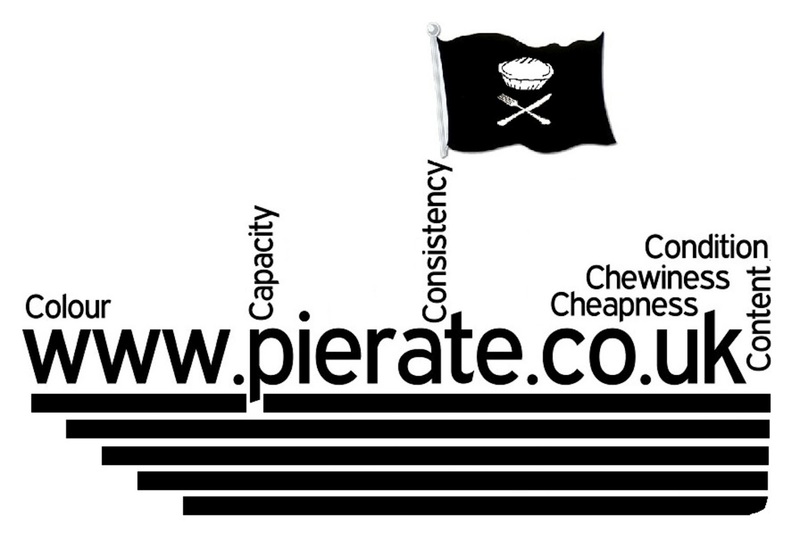 We've had some Pierate Highly Recommended pies at Mother Mash, Canteen and The Punch Tavern. Also recommended is the Newman Arms Pie Room in Fitzrovia, and The Windmill in Mayfair. But of course the first thought people have when thinking of London pies is the Traditional Pie and Mash Shops. There are some great historic pie shops in London - so much so that we have a "Traditional London Pie and Mash" article - but our current number one is the eel-ly good pie and mash at L. Manze on Walthamstow High Street. Meanwhile if you're specifically looking to sit down and enjoy a pie at one of London's restaurants, don't worry - we cover that in more detail in our Best Pies in London Restaurants article! 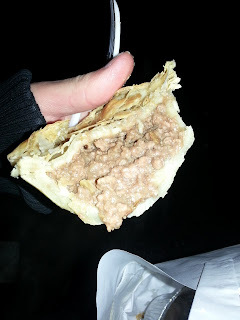 continue reading "Best Pie in London"
continue reading "17 Strange Pies You Still Might Eat"
Sometimes getting lost can be quite fortuitous. I got lost leaving the office the other day. Slightly bizarre given the amount of times I'd left the office and walked the same route, but the mind does do some strange things sometimes (I suppose you could say writing for a pie review blog is also one of those strange things). 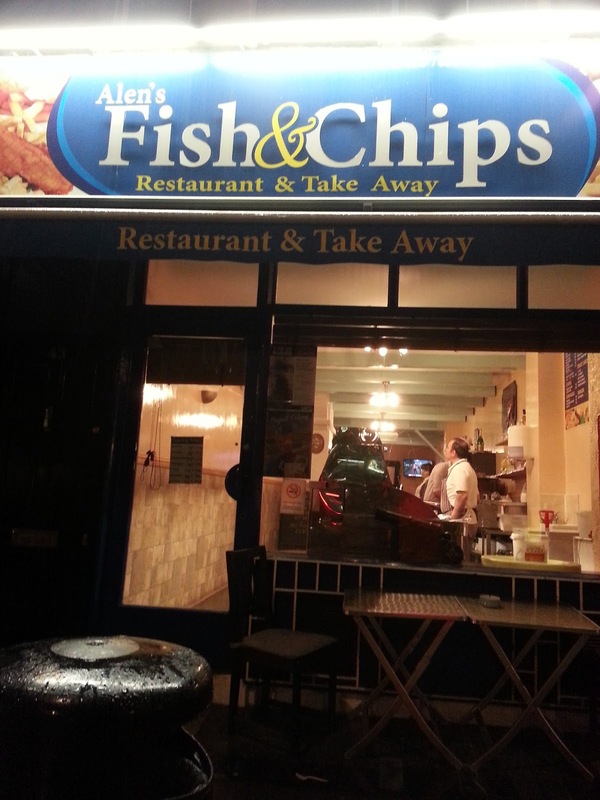 Anyway, after I'd come round from my temporary stupor and realised I was walking toward Holborn rather than Kings Cross, I found myself outside Alen's Fish and Chip shop. Not that amazing, you might say, given the abundance of fish and chip shops in London, but this one was different - it sold pies that didn't look like Pukka Pies. What's more, once inside, the man behind the counter told me they were handmade. Great! Despite being homemade, they still came in the typical flavours of chicken and vegetable, and beef and onion. I ordered a beef and onion pie. Here is the said beef and onion pie. I have to admit, it's been a little while since I actually ate this pie (there have been several other pie-related commitments I've had to attend to since then), so I can't totally remember the price, but I believe it was around the £2-£2.50 mark. Yes, let's say £2.25 - but don't quote me on that. 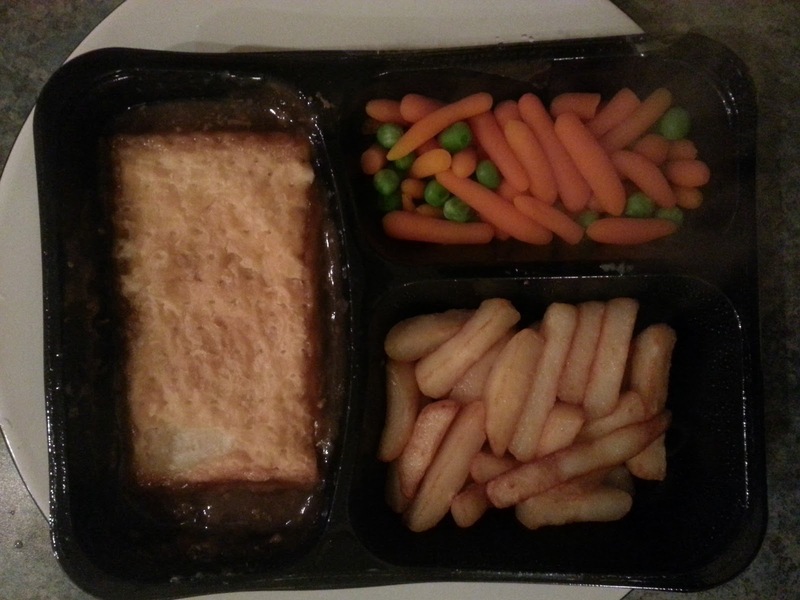 Anyway, it was a reasonable price and what you'd expect for a chip shop pie. Let's open up the pie! Pretty standard contents here again for a beef and onion pie. If it weren't for the original-looking pastry, I'd have doubts as to whether this was actually a handmade pie. It tastes pretty much like every other beef and onion pie I've ever eaten. There really nothing special here. It's a plain, standard beef and onion pie if you ever saw one. If an alien came to Earth and you wanted to show it the most typical beef and onion pie, you could show it this and be happy. The pastry was a little thin and a bit papery. I was uninspired, but I left Alen's happy and content with this reasonably priced, but more-than-a-bit boring, pie. continue reading "Alen! Alen! Alen's Fish and Chips! Beef and Onion Pie"
It's always nice to be invited back somewhere. And when that involves being invited back for free pie, there's surely nothing better! And that was the very kind offer made by The Junction Pub in Harborne, Birmingham. Clearly not satisfied with the best pie in Harborne (an ox cheek pie reviewed a few weeks ago), The Junction Pub wanted to be firmly put on the map with the best pies around. So with them boasting about the Chicken, Ham and Leek pie on their new summer menu, who am I to turn down a free invite?! So on to the pie. I must point out that the pub had acknowledged my hesitancy of a top-crust only pie in my last review and would look into future possibilities of full pastry encasement, but for now this would be another top crust review. The pie when it came out was golden topped in delicious light puff pastry, a sight to behold. A (seemingly personalised) added touch of an 'x marks the spot' on top of the pie was a very clever addition and well appreciated. Digging through the crisp top layer of puff pastry, the fork was met with large, tender chunks of chicken, succulent pieces of ham and leek. The creamy sauce was slightly thin and runny in parts, but well complimented the chicken. The meat was very plentiful and smothered in delicious creamy sauce. The main downside once again was that I quickly ran out of pastry due to it being just a top crust pie. 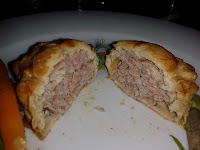 This left me very filling-heavy, and while a tasty filling it did suffer from the lack of pastry accompaniment. The chicken pieces could have been diced slightly more finely to spread it more evenly through the pie, however all in all the filling was very good and the chicken top notch. While my preference would be the ox cheek pie I had previously, this chicken pie once again highlights why The Junction Pub is the place to be for a fine dining experience in Harborne. And who knows - if they work on their fully encased pastry recipe, they could be competing for best pie in Birmingham or the UK! continue reading "At the next junction, turn back for Chicken Pie"
So I had the Big Cheese from Pieminister. 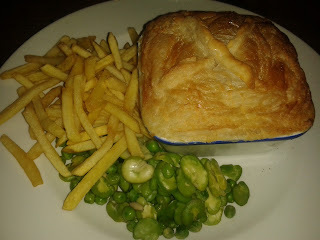 Now, I'm normally a huge fan of Pieminister, but I really did not enjoy this pie. Marketed as "West country cheddar, garlic cream cheese and buttered onions", the combination of richness got the better of me and I felt it was just altogether too cheesy and rich. I'm not a fan of cheese and onion crisps at the best of times, and to me this was just another level of saltiness. In terms of quality of pastry, capacity and chewiness, I could not find fault. But the taste was not to my liking. Very rich and salty. And at £6 for mash and pie, it was quite pricey for what was actually a DNF (did not finish). Perhaps if you're a fan of cheese and onion, you might like this pie. For me, it was very rich. 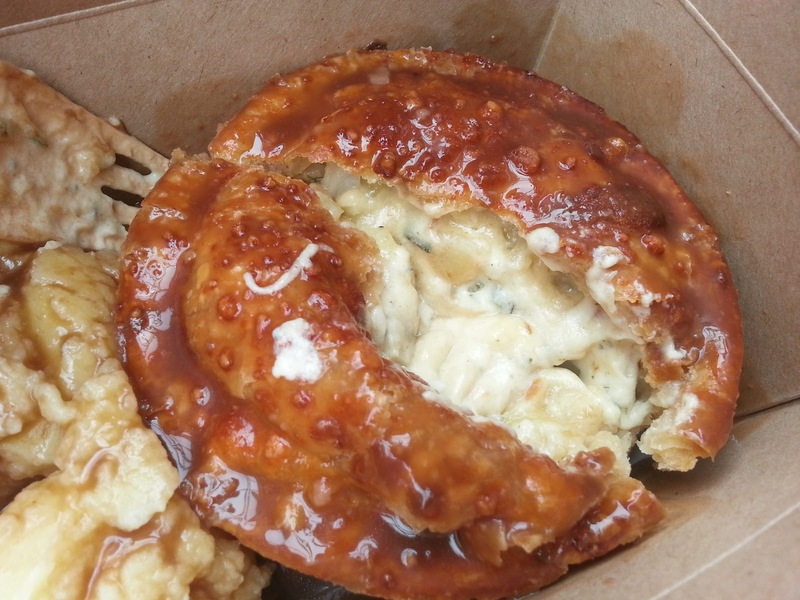 continue reading "Pieminister Pie Review - Big Cheese"
The British Pie Awards offer a great opportunity for the Pierateers to find out about where some great pies are to be found. This year the pierateers even attended the event which is held in Melton Mowbray. This was a chance not to be missed, the Pierateers asked where the best Melton Mowbray Pork Pies could be found. 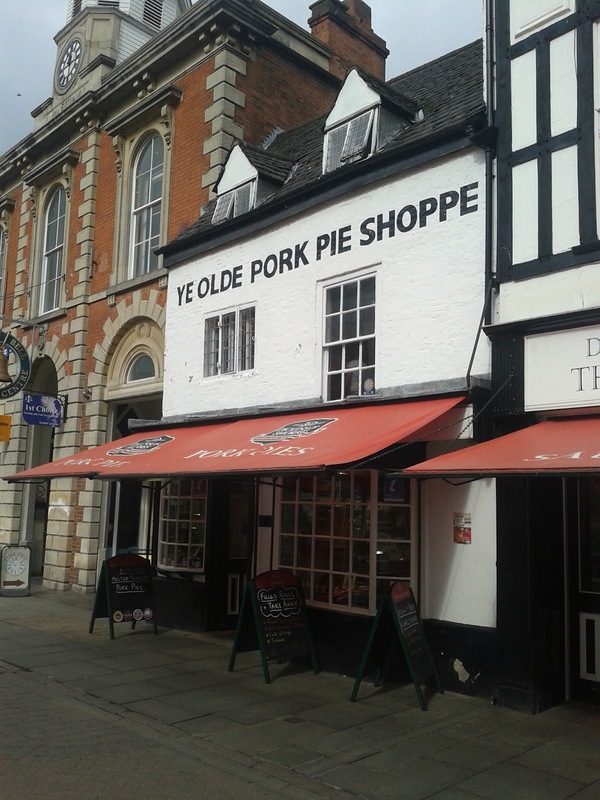 Ye Olde Pork Pie Shoppe was recommended as the place to go. Owned by Dickinson & Morris this was certainly a quaint old pork pie shop and I can see why they call it a 'shrine to pies'. Pork pies in all shapes and sizes greet the eye as you walk into the lovely old building. 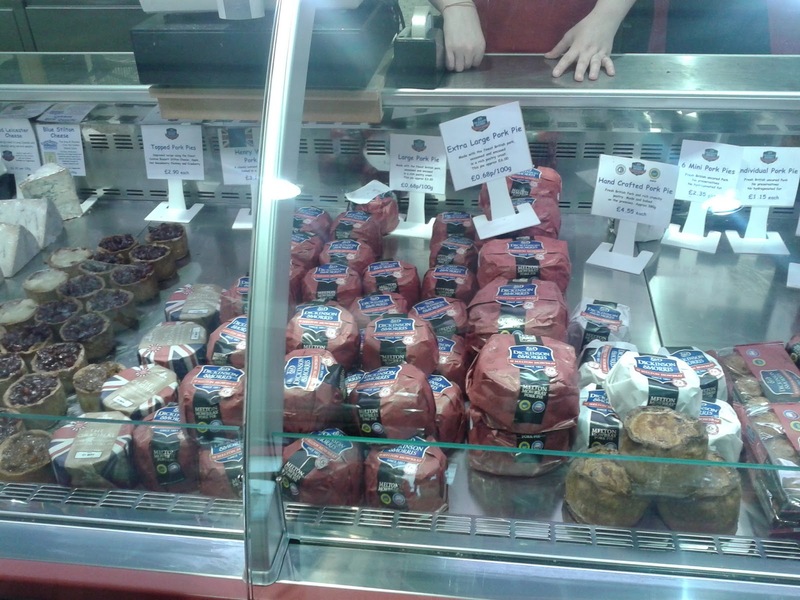 There is even the chance to learn how the facinating Melton Mowbray Pork Pie is made. I learnt that a proper Melton should have grey meat instead of pink which is how to spot them. 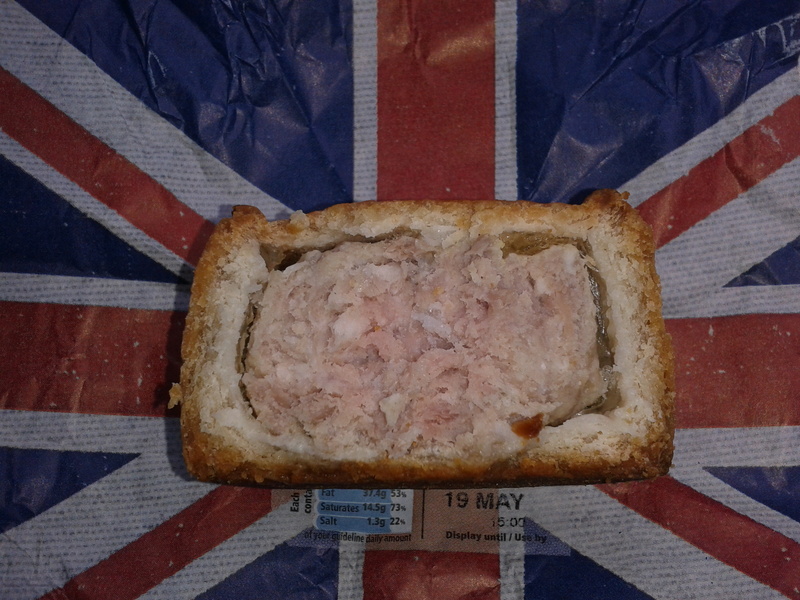 Dickinson & Morris have a proud history and are one of the founding members of the Melton Mowbray Pork Pie association. Also, their managing director Stephen Hallam does great work organising the British Pie Awards. I opted for a pack of mini pork pies so that I could take some in to share with my colleagues at work. At £2.40 this wasn't a bad price for a pack of six and I love their advert (see below). I was very glad I paid a visit to Dickinson & Morris as these were fantastic pork pies. 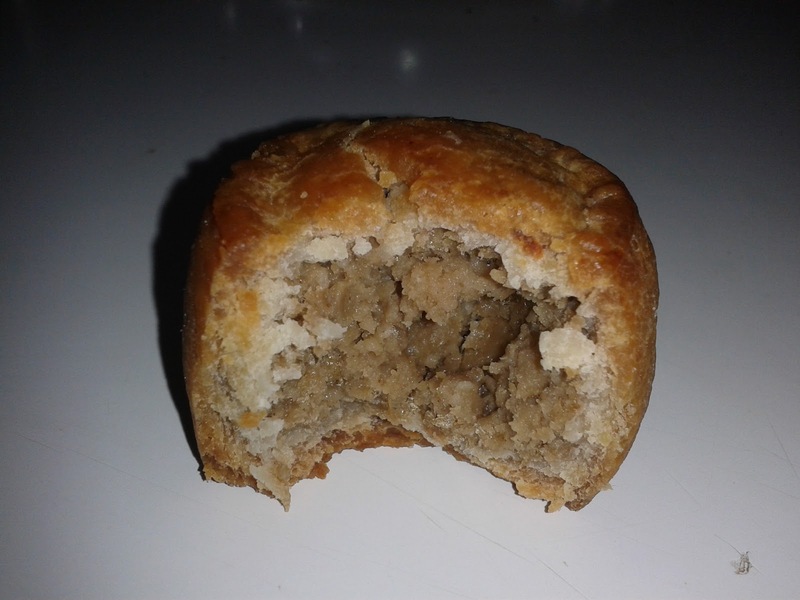 The experience with most pork pies starts from the first bite. 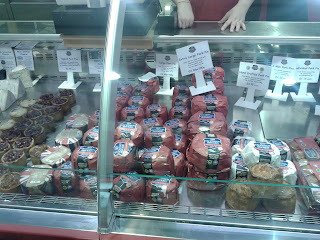 However, these pork pies also had a fantastic smell which was calling me to eat them all the way home. The pastry was really soft and the filling melt in the mouth. The capacity was great for these small pies and they were full of content. Certainly some of the best pork pies I have ever eaten. 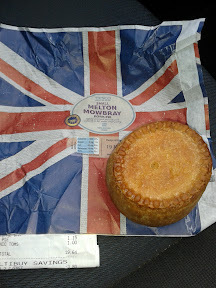 All well and good but what I needed now was to try another up market pork pie to compare it to. I picked up a pack of four Walker & Son Mini Pork & Pickle pies in my local Morrisons for £1.50, slightly cheaper per pie but a comparable price. These were very similar to the Dickinson & Morris with a smooth texture and delicious moistness. However, I loved the sourness of the pickle contrasting with the slightly sweet pork. This one comes in as the winner in this heavyweight contest between Melton Mowbray Pork Pie producers. 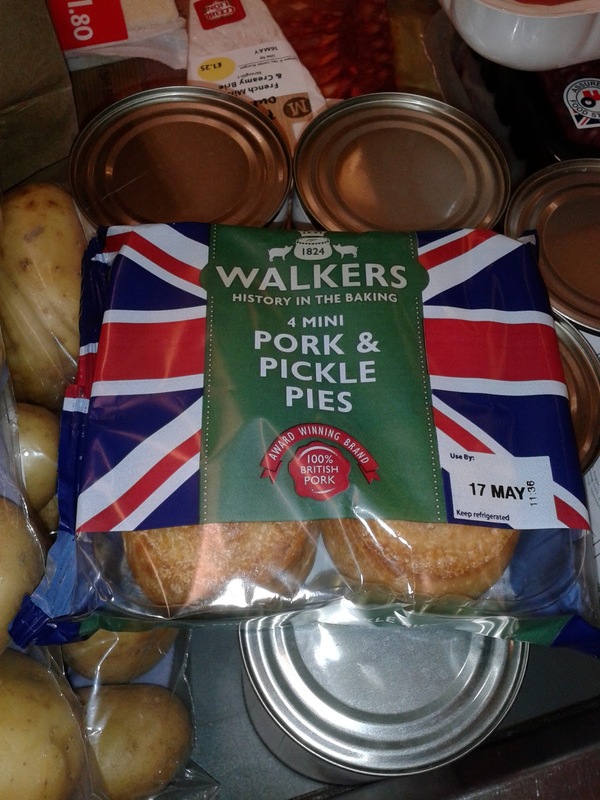 It is no surprise that Walker & Sons came in as winners in the Melton Mowbray Pork Pie category at the British Pie Awards. In fact they are regular winners and this year made all the top three pies. What did surprise me was that the the winner was made by Walker & Son but sold under the Dickinson & Morris brand. What surprised me even more is that they are in fact the same company called Samworth Brothers who also make Ginsters products. There was me thinking these were small pie producers! In the end it wasn't really much of a contest, no wonder the pies were very similar. Recently they have started supplying these pies to large stores. I only hope they continue to produce them to such high quality as genuine Melton Mowbray pies are produced in ever larger quantities to meet the growing demand for this geographically protected product. continue reading "Starter, Main & Jelly for Dessert"
There are times when it can take a good few days to think up a witty, clever or punderful play on words to include in the title of a pie review on pierate. This, of course, was not one of them! 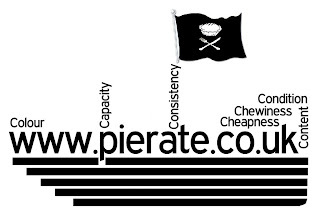 For anyone who delves into the pie reviews on the Web’s premier pie reviewing resource will know that if there’s anything we Pierateers like almost as much as our pies, it’s a good play on words. So the following paragraph just writes itself, to be honest. I guess the very reason you’re reading this review is determine whether the steak pie I ate at the pub is more Jekyll or Hyde in nature. For, as we all know, there can be some strange cases of things being called pies but which are clearly not pies, or have a split personality of looking great on the menu but rather disappointing on the plate. 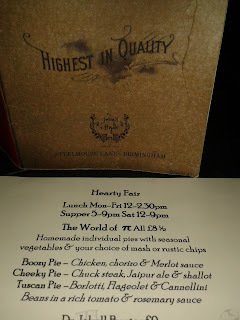 However the attraction of a “World of π” section on the menu was very appealing and gave me strong hope for a winning formula to my pie selection. Had they found the right potion? 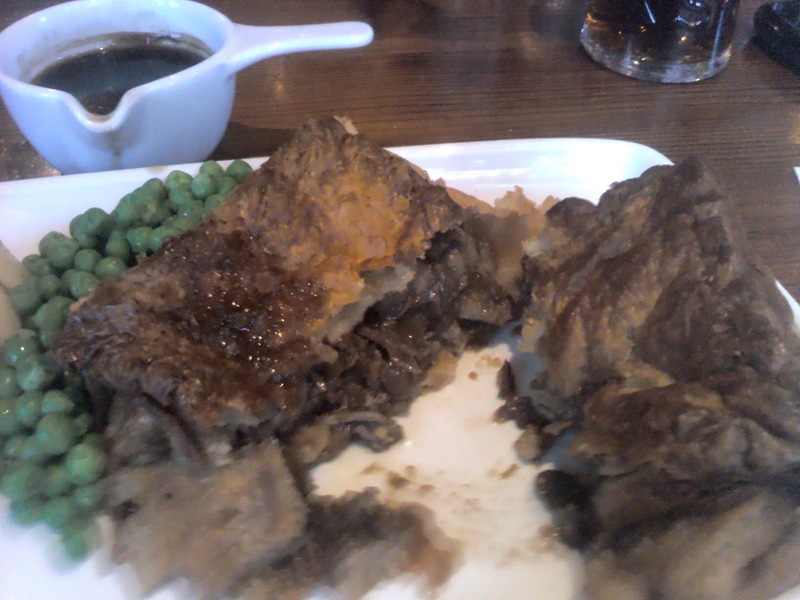 Well there was nowhere for this pie to Hyde when it came to being reviewed by the Pierateers. 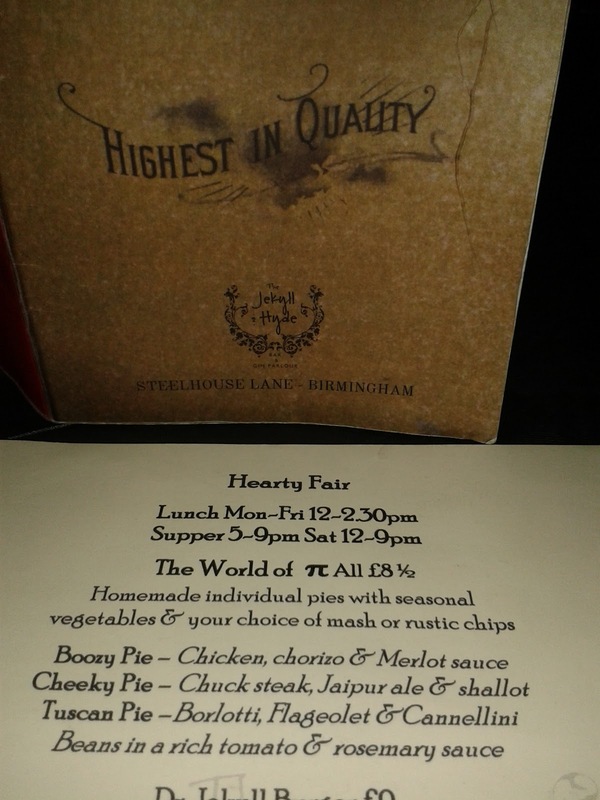 I went for the Cheeky Pie – Chuck steak, Jaipur Ale and shallot. 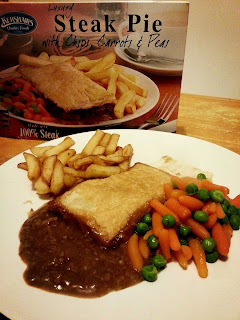 continue reading "Would the steak pie be more Jekyll or Hyde?" Is "luxury" losing its meaning? Too many times have I been promised something "luxury", and I have been left sorely disappointed. But surely a "luxury steak pie" must be pretty good, right? Come on Kershaws, don't let me down! 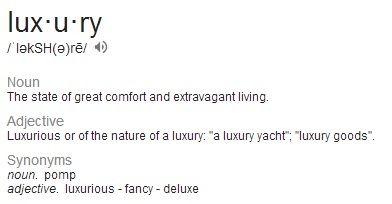 Bring back the meaning of the word luxury! My initial reaction is that it looks terrible, but I remain vaguely hopeful that the pie might look more appetising once it has been cooked. There's an option to microwave it, or to oven cook it. I'm so disappointed with the look of this pie that I'm not going to even give it the time of day to cook it in the oven. Microwave it is. Seriously. What is this? I have a puddle of gravy, swimming with meaty strands, topped off with a limp paper-thin rectangle of pastry. 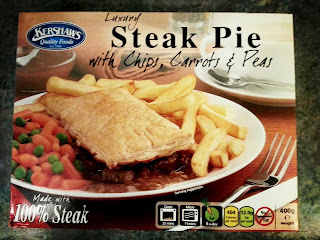 I know I microwaved this pie (and probably would have got slightly better results after oven cooking it), but I am struggling to find anything remotely "luxury" about this pie, as was described on the packet. The steak is chopped into odd little meaty cubes. Their perfect symmetry slightly creeps me out. In short, not only do I not think this pie qualifies as "luxury", it's devastatingly also a top crust. 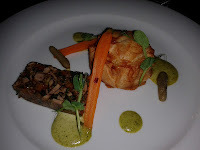 continue reading "A "Luxury" Pie is a Big Claim"
Surely one of the most gourmet pies I have ever eaten this pie at Satis House in Yoxford, Suffolk was a delight to find on the menu. Normally you scan straight to the main course expecting to find at best a beef or chicken pie on the menu but Satis House have to decided that a pie is for life and not just for main course by putting a Rabbit and Bacon pie on the starter menu. At £8.50 for a quite small pie this probably scores the worst for Cheapness for any pie I have ever eaten. However, let’s not forget that I was paying a premium to eat what can only be described as the posh setting of a lovely countryside hotel restaurant. The pie was a beautiful Colour and came in a most Satis-fyingly well presented Condition. There were some fine pieces of carrot drapped over the pie as if the rabbit were still alive and attempting to gnaw on them. It also came with some meaty jelly of the kind that you might expect to find in the pie. It looked like a pork pie but in fact the Chewiness of the pastry was much less than a pork pie. It was actually quite nice and light pastry although a touch drier than I would have chosen. The Capacity was pretty good for a small pie, as it had a good height to it. It was packed with meaty Content which was pieces of rabbit and bacon ground up and stuck together. 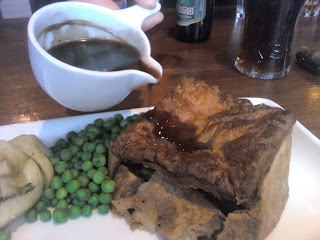 There wasn’t really any gravy as such although there was a little bit of moisture which caused it all to hold together. The meat had a good Consistency and flavour which was certainly well above average for a pig based pie however I didn’t feel that I could really taste any rabbit. The bacon was too salty and strong flavoured so I couldn’t really isolate the flavour of the rabbit in so small a morsel. Overall though, a good effort from Satis House and it would score quite highly if it wasn’t so expensive. 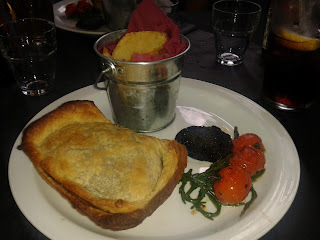 I was certainly left Satis-fied by their attempts to add something a bit different to the menu, I would be delighted to see more establishments offering some pie goodness on their starter menus too. However, the lack of pie in the more traditional main course and dessert menus meant that the three course pie meal is still just a dream. Hopefully not for too long! See where this pie featured on our list of the best pies in Suffolk. continue reading "Satis-fied By A Bit of Rabbit Baked With Bacon?" Heritage pie can’t keep up in the 48 hour charity challenge! The challenge was simple: Find a pie shop in Rowley Regis, so that I could eat a pie while watching what will hopefully be confirmed by Guinness World Records as the longest five-a-side football match in the world! The difficulty: Would the pie live up to the expectations set of eating pie while watching such an epic, 48 hour football marathon?! Well, we all know eating a handmade pie from a local fish and chip shop can be a risk. Let's face it - there's a reason why Pukka Pies say "don't compromise!" Well the pie eaten from Heritage fish bar (the only fish and chip shop selling pie that I could find near Rowley Regis train station) certainly compromised everything good about a pie. Let me start with the filling. 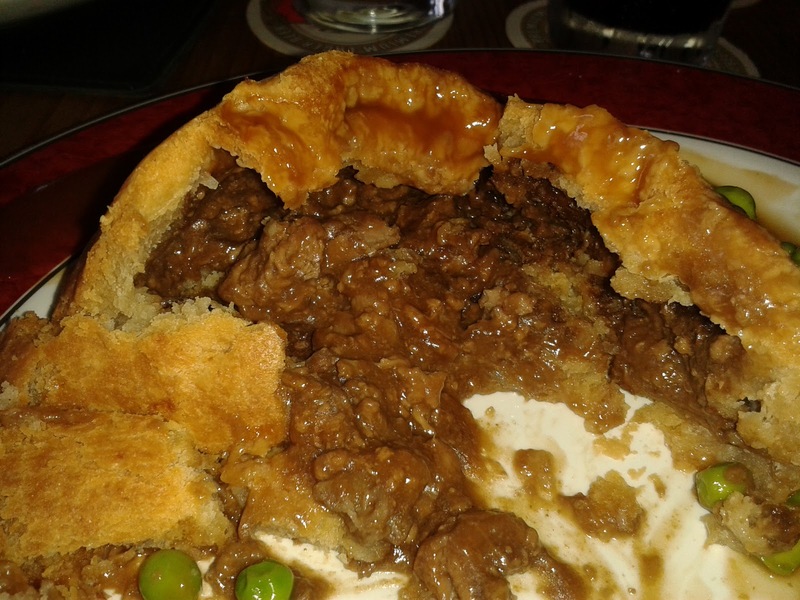 The pie I think I ordered was a steak and kidney. I say "I think" because I can't actually be 100% that was what I was eating. It tasted reasonably steak like, but I found the meat to be so chewy and gristly and the filling quite spicy that I could not really tell. Then there was the pastry. It didn't help that the pastry was already damaged before they then took it and re-heated it in a microwave. But that microwaving did it no favours whatsoever. I found it to be soft, greasy, and prone to falling apart. In my view it tasted undercooked and I found it hard to enjoy it. The only positives were that the gravy was alright for dunking chips into and it was a fully encased pie. 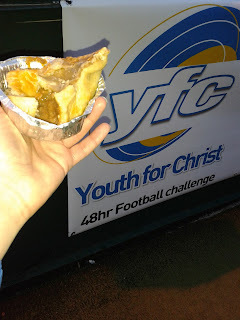 Certainly not one I'll be buying again, as I struggled to finish this one, but at least I can say I ate pie while watching my mate @bowlands raise money for charity as part of the longest 5-a-side football match in the world! Click here to read more about their 48 hour football match to raise funds for the work of 'Youth for Christ' or donate here. continue reading "Heritage pie can’t keep up in the 48 hour charity challenge!" 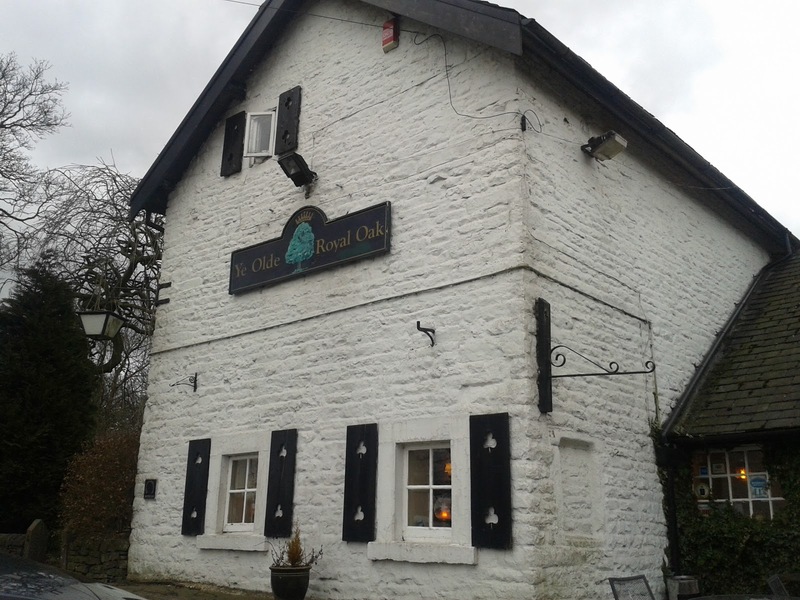 While on a stag do walking in the Peak District I was delighted to see that Ye Olde Royal Oak Pub in Wetton, Peak District, which we had booked to eat in, had a steak pie on the specials board. The pie was handmade at a local butchers and there were only a few pies left, so as expected I made sure I got in on the action! The pie itself was quite large upon arrival, clearly over shadowing the other food on the plate. However unfortunately when I cut into the pie, the cross-section harboured quite a lot of air. However, determined to eat and rate what was there – rather than dwell on what wasn't – I delved into the pie. And I am pleased to say that what was there was generally pretty good. The steak pieces were very tender and the beef gravy complimented the meat very well. The chunks of meat were big and, while they could have been a bit better distributed throughout the pie, the filling was very good. As previously alluded to, the capacity was not the greatest, with more crust to filling ratio than I would like, however the crust (in particular the top crust) was golden and very nice. The side and base pastry was not too thick and with a bit more filling compared to crust it could have been a lot higher ranked. All in all I would happily go back there for another pie, hopefully finding pie on the full menu and not just the specials board! Tasting good, this pie would really peak if it had a bit better filling to crust ratio. And many happy returns to Seth and Rachel, who got married today. Hope to share more pie with you both in the months to come! continue reading "Taking more than a Peak at the Wetton Pub Steak Pie"
With Pie once again on the menu at Aston University’s main cafe (CafeTierra), there was no need to persuade the Pierateers to pay another visit following their reviews of the Beef and Onion and Chicken and Mushroom Pies. And with strong 2:1s in the previous two markings, all eyes were on the Pie Satisfaction Survey this time as the latest pie was under assessment. The pie on offer was a Beef and Mushroom Pie. With the golden pastry back on this pie (surprisingly lacking in a paler pastry topping to the Chicken and Mushroom Pie), the Pierateer dug into his pie and thoroughly enjoyed the tender pieces of beef on offer. The pie had plenty of beef pieces, which certainly beefed up the flavour and provided a nice compliment to the tomato, herb and beef gravy within the pie. You may recall the tomato flavour to the Beef and Onion pie previously eaten a few years back at Aston University (almost a tomato-based Bolognese within a pie). While this Beef and Mushroom pie was certainly not at that level of tomato-icity, I have to say that once again the Aston chefs get top marks for delightfully blending some tomato into the pie filling. The mushrooms were also very soft and tasty. 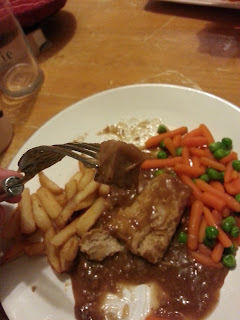 While I would say they had been slightly heavy handed with the herbs, it did add a nice flavour to the gravy and with a little less seasoning this gravy would be spot on. However once again the pie fell down slightly due to being a top crust and therefore lacking on the pastry front. While a very nice meal, I was quite quickly left wanting more pastry to complement my pie filling and having to “ration” my ever diminishing pastry with the large amount of filling left. I’d certainly like to try a fully encased pie at Aston University one day and hope that, if a pie taster is needed, they will know who to turn to! Once again I’d give this pie a strong 2:1 in our pie rankings system, with the main feedback being a delicious tender beef pie with intriguing tomato-ey gravy, but a significant lack of pastry. I’d certainly have another though! 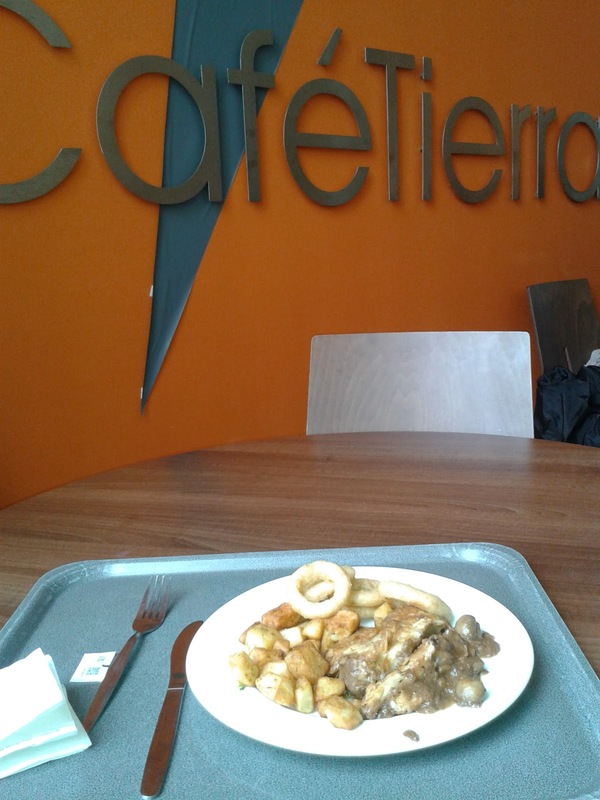 continue reading "Beefing up the Aston student meals"